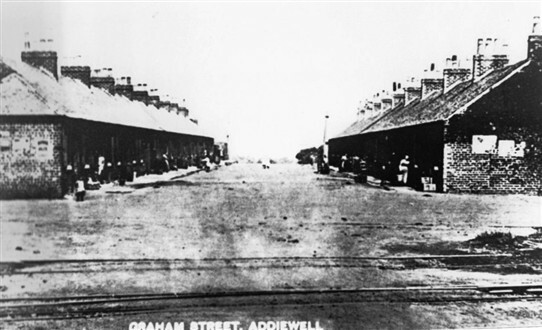 Graham Street, one of the earliest in Addiewell. John Kelly. Copied by Adam Prentice. All rights reserved. S1. 209. In 1950, an old Addiewell resident recorded his memories of the old village. He describes his grandfather coming to settle in Addiewell in 1879 after getting a job at the Oil Works. In those days, the only houses were part of Grahame Street, Cross Street and the south side of Livingstone Street. Gradually the other high rows and low rows were built. Particularly interesting are his memories of the farmhouses that disappeared under Addiewell shale bing. His memories were published in the Midlothian Advertiser on 6 January 1950. Who he was, we don't know, but he wrote under the pen name of "Briech Mill". His article is attached at the foot of this page. A later writer recorded his memories in two articles in the Midlothian Advertiser in March 1967. In the first article (3 March), he dealt with the Wee Rows, water supply, sanitation, and the Presbyterian churches. In the second article (10 March), he covered the Catholic Church, village life, sports and games, nicknames, a few teachers and famous natives. Both of these articles are attached in full at the foot of this page. Bill Wardrop's committed his memories of old Addiewell to paper in 1978, and they were published in the Courier of 23 June 1978. His memories of the industries of Addiewell after the closure of the oil works are of particular interest. His whole article can be read in the attachment below.